According to Statistics Estonia, the unemployment rate was 6.5% and the employment rate was 65.1% in the 2nd quarter of 2015. Compared to the second quarters of the previous years, the number of long-term unemployed persons fell under 20,000 for the first time after the recession. The number of unemployed persons changed very little compared to the first quarter and was estimated at 44,400. Compared to 2nd quarter of 2014, the number of unemployed persons decreased approximately by 3000. As the number of short-term unemployed persons increased slightly compared to the same quarter of the previous year, the decrease in the number of long-term unemployed persons played a bigger role here. Among unemployed persons, poverty risk is the highest among the long-term unemployed, i.e. unemployed persons who have been seeking work for at least 12 months. A longer period without work will devalue a person’s human capital gained through previous work and education, and the person may lose the habit of working. Employers can also be rather sceptical about the working abilities of the long-term unemployed. In the 2nd quarter of 2015, there were approximately 19,200 persons who had been seeking work for more than 12 months. While unemployment was characterized by a moderate trend of decline, employment increased moderately. Employment rate increased compared to both the 2nd quarter of 2014 and the 1st quarter of 2015 by more than 1 percentage point and was 65.1% in the 2nd quarter of 2015. The number of employed persons increased to approximately 640,000. The increase in the number of employed persons was not only caused by the decrease in unemployment but also by an increase in activity on the labour market. Young people influenced this increase in activity the most. In the 2nd quarter of 2015, the employment rate of 15–24-year-olds increased by nearly 5 percentage points and reached 44% compared to the same quarter of the previous year. One reason for this was the increase in the share of young people in the age where they are more likely to enter the labour market. It can be also said that the increase in youth activity on the labour market compensated for their declining overall number. In the 2nd quarter of 2015, compared to same quarter of the previous year, the number of persons who could potentially be active on the labour market had diminished by approximately more than 7000. In the 1st quarter, labour force participation rate was the highest that it had been in 15 years in quarterly comparison. The same could be said about the 2nd quarter of 2015, when labour market participation rate of 15–74-year olds was slightly under 70%. In other words, 69.6% of the working-age population was active on the labour market either as seeking work or working. The increased activity helped to decrease the influence of overall declining numbers of working-age population. Moreover, compared to the 2nd quarter of 2014, the number of persons who were active on the labour market increased roughly as much as the number of working-age persons decreased (by more than 7,000 persons). • In Q2, employment up by 1.7%, yoy, and unemployment rate down to 6.5%. • In 2016, employment is expected to fall a bit. Estonia’s labour market tightened further in the second quarter, but at a slower space. The annual growth of employment slowed from 2.9% in Q1 to 1.7% in Q2. The number of inactive and unemployed declined compared to last year. The inactivity decreased the most among the retirees and those studying at school or university. Unemployment rate decreased to 6.5% in the second quarter (7.0% in Q2 2014). The Estonian Unemployment Insurance Fund’s data shows that unemployment has declined at a slower space in recent months. Seasonally adjusted figures show even a slight increase in unemployment in Q2. Unemployment rate has reached a level where an additional decline of the rate is already difficult. There are around 44 000 unemployed in Estonia currently, out of which 11 000 have been looking for a job for more than 2 years. The number of people who have become unemployed recently, has grown. Some sectors, who face weak export demand and low output prices, find it hard to keep up with current wage growth. Employment will grow this year due to the labour registration obligation, which will push up official employment statistics in the first half of the year. Also, strong consumption supports employment in the services sector. In 2016, employment is expected to fall a bit because of a lower supply and demand of labour. More expensive labour encourages investment in machinery. Some enterprises might decrease the number of employees because of low (export) demand, i.e., agriculture and specific sectors of the manufacturing industry. Unemployment rate is expected to remain low, however, although it might increase marginally next year due to decreasing working-age population and problems in certain sectors. The flash estimate from Statistics Estonia shows that the Estonian economy grew by 1.9% over the year to the second quarter, and by 0.8% over the quarter, adjusted seasonally and for the number of working days. The growth in manufacturing output in recent months and figures for exports had indicated that the economy grew more slowly than the flash estimate showed, but the flash estimate indicates that while exports did act as a brake on growth, they did so by less less than the amount added by domestic consumption. 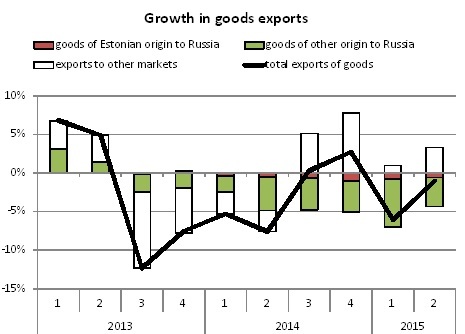 Exports mainly declined because demand in Russia is weak and exports to other markets have not been able to compensate fully for this (see Figure). The index of European economic confidence strengthened again for the second consecutive quarter. However, there are few areas of the Estonian economy that are able to benefit quickly from the improvement in the European economy and increase exports, as traditional target markets for exports by Estonian companies have been faring less well. Exports to Russia dropped by one third in the second quarter, which reduced GDP growth by around one percentage point. Exports to Russia fell by less than they did in the first quarter, when they halved. Exports to Russia largely consist of products from other countries and so the main impact of the reduction in exports was felt by companies providing intermediation services and transport companies. The rouble has continued to slide in recent weeks, making it likely that Russian demand for imported goods will remain low. Although manufacturing output declined, the sector still made a positive contribution to GDP growth. This means that the value added of manufacturing industry must have grown, with fewer inputs being used for a similar volume of output. Wood production has boosted output from manufacturing, and has grown relatively stably in recent years. The fall in the price of energy meant that the energy industry and oil production had a negative impact on industrial output in the second quarter. Although wages and household incomes have started to grow more slowly, retail sales and consumption have continued to grow rapidly. Available data on corporate financial results for the second quarter indicate that major investments were made in the second quarter, but they are likely to have had a one-off impact on economic growth. There is more spare production capacity in most sectors than there was before the economic crisis of 2008, and production can be increased without major investment. Spare capacity shrank during the second quarter however, meaning there was probably an increase in the need for investment in growing sectors. Consumer prices decreased further in Estonia in July. CPI fell by 0.4%, month on month, and 0.3%, year on year. Consumer prices declined due to lower energy prices. Motor fuels were 12%, electricity 7%, heat energy 4%, and natural gas 20% cheaper than one year ago. On global markets, crude oil price was 38% lower than one year ago in EUR (-50% in USD, yoy). Due to cheaper energy prices, deflation is expected to continue in the coming months. According to our estimates, CPI is expected to decline by 0.2% in 2015, after a marginal drop of 0.1% in 2014. Cheaper prices benefit consumers but put additional pressure on producers. After the first six months of this year, producer prices in the industry have declined by 1.7%, year on year. During the same time period, export prices have shrunk by 3.8% and import prices by 3.3%. The decline in prices has been caused by modest demand on world markets, as well as an oversupply of commodities. The large drop in export and import prices in Estonia was caused by cheaper oil prices, which supressed the prices of Estonia’s petroleum products and, to a smaller extent, chemical products.